After more than a month off from having the baby, we needed to turn our attention back to the garden again. Time to harvest corn, till, pull some weeds and make ready new sections for next year. After listening to a radio drama about a little boy who enlisted in God’s army and took orders from the Captain’s book (Bible), we decided to try the same thing. The morning of our harvest we read in Proverbs about honoring God with your first fruits and then your barns will be filled to overflowing. 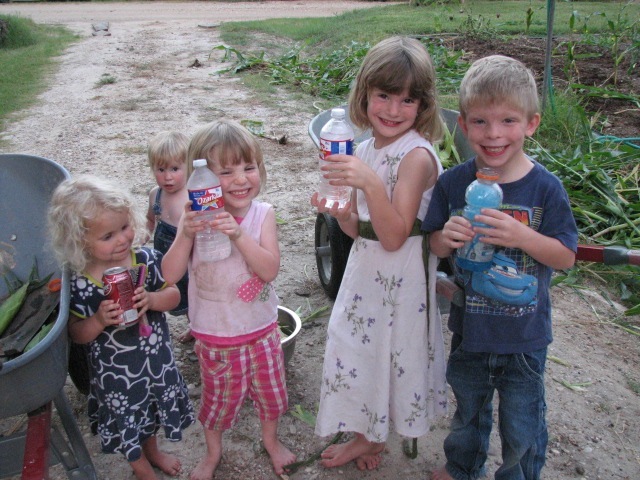 I asked the kids how we might honor God with our corn harvest. They suggested giving the first ones away to God, and we discussed which friend might be the lucky recipient. 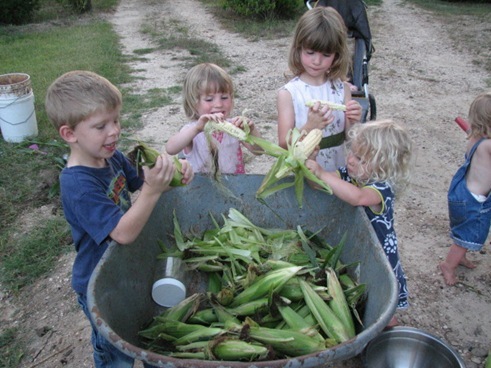 That evening we pulled the ears and the kids had a grand shucking party while Daddy tilled and I pulled up the stalks. I set aside several good ears to give away. As we were working, the package truck drove by on his way to deliver to a neighbor. My Dad worked for FedEx for a time and I had the privilege of helping him sometimes. I have a great sympathy for these hard workers and knew this truck was out late at the end of a long day. Iris enjoys some of the first fruits. The idea popped in my head that the driver might enjoy some garden produce and maybe we could brighten his work day. 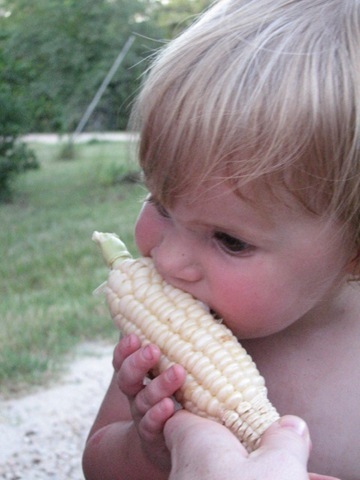 I felt a little shy to hand something out to a complete stranger and wondered if he would even like corn, but like the boy in the story, I knew I had to obey my orders. I told the kids what we would do and then went to the end of the driveway to meet the truck as it came past. The truck stopped and the driver was delighted to receive the corn and a cucumber. He thanked me several times and then stopped me as I backed away from the truck. He asked how many kids, then pulled out his cooler and handed me the rest of his cold drinks he had packed for the day! I thanked him and he drove off, leaving an ecstatic bunch of kids behind him! What a neat way for God to illustrate His Word and the reward of following His orders for the day. Great idea. Your kids learned to share and that kindness brings rewards.